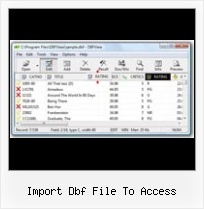 Visual Basic :: Transferdatabase Dbf Into Access Is it possible to use transferdatabase method to import a dbf file to Access (mdb)? Dim acc As New Access.Application acc.OpenCurrentDatabase "C:db1.mdb"
Vb Net Dbf File Import : DBF Viewer, DBF Editor, DBF Convertor Vb Net Dbf File Import "..We export data from access to dBase.. Then I found your program.. Even better!" free read dbf dbse files windows "..I searched for DBF readers..